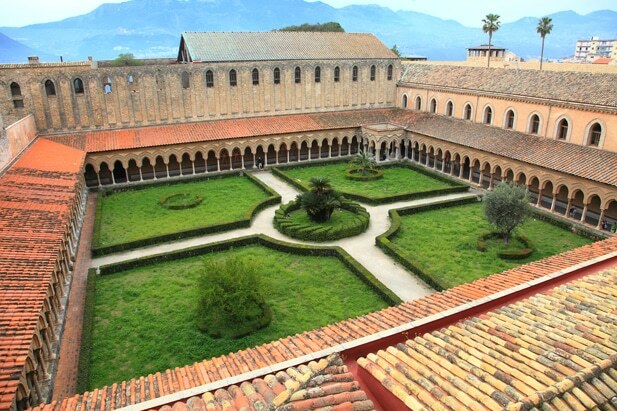 In this article, I will briefly talk about the Cathedral of Monreale, one of the symbolic monuments included in the UNESCO list and a major milestone in the Arab-Norman Sicilian route. Hello, it’s me again, Don Tano Bongiorno. I am the semi-official tour guide for the bustling city of Palermo, and for the beautiful island of Sicily it belongs to. 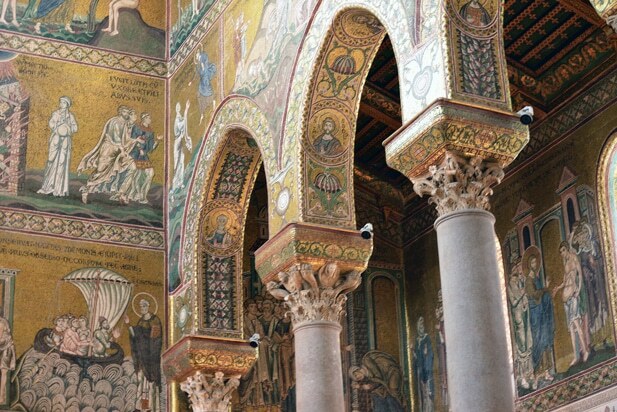 Go ahead and get comfortable, devote about five minutes to read this article and learn about one of Italy’s most important monuments: the Cathedral of Monreale. Don’t worry, I have a special way to deliver this information. Together we can envision being in the cathedral and I will describe what you need to see, step-by-step. It is helpful for you to imagine it so that when it is standing before you, you know what you should be doing. This information is all the way at the bottom though, so for now, let’s get our imaginations flowing. 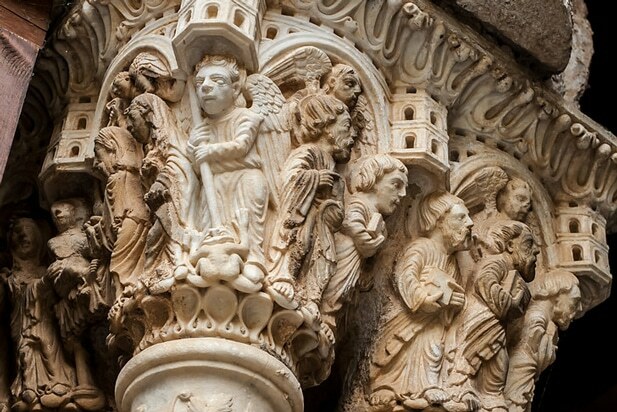 Let’s not get lost in the unproductive chatter and we can start our virtual tour of the Cathedral of Monreale amongst the kings, angels and precious marble structures abounding inside. The Cathedral of Monreale and the Cathedral of Palermo, history or legend? Imagine for a moment that you are in a golden church, completely covered with shiny mosaic tiles. It might remind you of the ones you probably constructed in school with cardboard, only here, they are made of gold, silver, enamels, and marble spanning nearly 6400 sq. meters. This is pretty impressive, I know. Fully understanding this church is reading it like it’s a book. Place yourself at the end of the centre of the Cathedral. Look right, and then look left. You will find mosaics depicting stories from both the Old and New Testaments of the Bible. There are images of the creation of Heaven and earth, the creation of the creatures that inhabit the planet, and when Cain killed Abel. When the Cathedral was constructed in 1100, the believers here could not read and write for the most part. To counteract this, the priests chose images, paintings, and mosaics to help people to understand the stories of the Bible. Now, look at the centre: who is that huge figure set in the apse behind the altar? Does it seem as though he’s looking at you no matter where you stand? 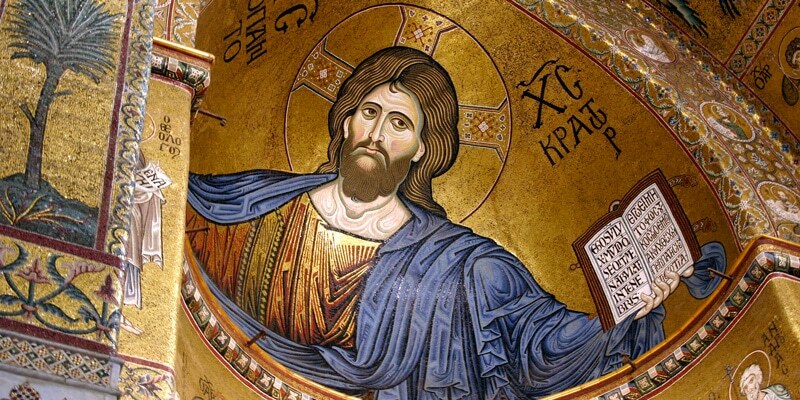 He is the Christ Pantocrator, or more simply put, the creator of all things. The artists have placed the golden tiles by following concentric circular lines: a technique which is unique in Italy. This is what provides the illusion that Christ is following your movements around the area. One of the most curious things about this church, however, is its columns. How many are there? There are nine on each side. This might not seem all that peculiar, but the good observer can notice a particularity. They are all in grey granite except for one. The only one not in grey is the first on the right from the main entrance to the Cathedral. This is made of a cheaper marble that is a different color. Was the granite just unfinished? Why would it be like this? In truth, behind this apparent banality, there is a profound meaning. The primary columns support the arches of the Cathedral and indicate that God holds up the church. The lesser quality column showcases the role that mankind must play to help. The column made of the cheapest materials represents us, or humankind overall. Now leave the central nave and move to the one on the right. Who is hiding in these two sarcophagi? 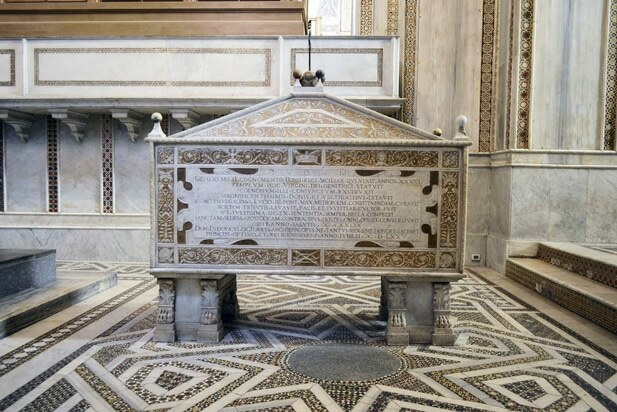 In the larger one, William I, called the “bad” father of “good” William II, buried in the smaller sarcophagus constructed of white marble. This cathedral was constructed by William II, king of the Norman dynasty in Sicily. But how did he afford it? This is where the story gets a little interesting. According to legend, at the age of 20, the Madonna appeared to William II in a dream and revealed a secret location where his father had hidden treasure. 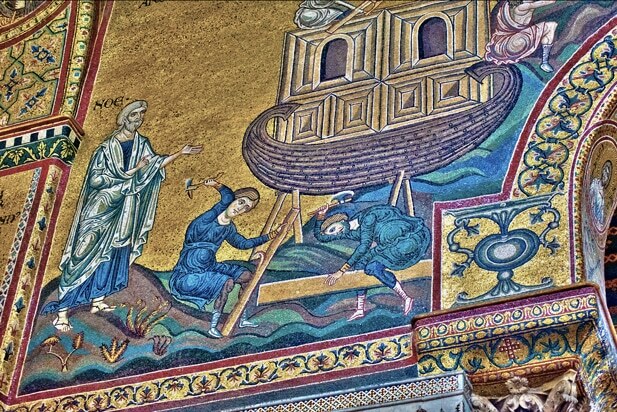 With those riches, at that very point, William II supposedly built a temple dedicated to Mary. Our journey is about to end. If you want to have a unique experience before you leave, there is a door at the bottom of the right aisle. You can hardly even tell that it is there. But, if you enter and begin to climb the stairs, you can find yourself in the attic of the Cathedral. You are narrowly squeezed between the tunnels and then you will come out on the apses and admire Palermo and the Valley of the Conca d’Oro from high above. One of the many stories told and passed down over the centuries about Palermo and its dominations places the Cathedral of Monreale and the Cathedral of Palermo in close contact. A rival spanning centuries, so to speak. 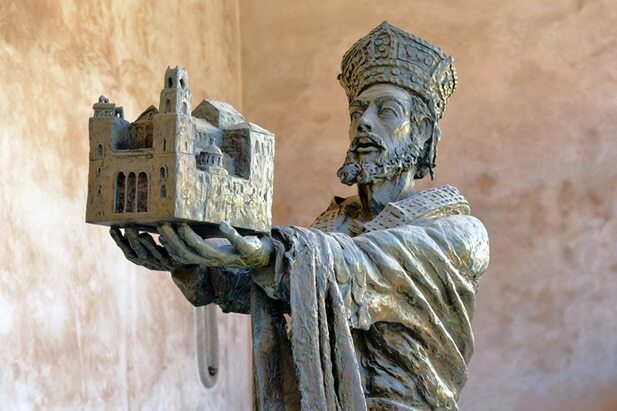 It is said that in the twelfth century AD, William II, while overseeing the construction of the Cathedral of Monreale, had Gualtiero Offamilio as the most bitter of rivals. But who is this man, and why do you care about him? At this point, Offamilio was the Archbishop of the Diocese of Palermo and surprisingly a former tutor of William II. During that same period of Monreale’s Cathedral being built, Offamilio was in the process of constructing the Cathedral of Palermo. William focused on embellishing the interior of the Cathedral with wonderful mosaics that recount stories from the New and Old Testaments, leaving out the aesthetic details of the façade. But Gualtiero didn’t just sit and twiddle his thumbs. He focused extensively on the beauty and grandeur of the façade, enriching it with pointed arches inspired by Islamic architecture, small columns with statues of saints, bell towers, lintels, battlements, pinnacles. But by doing all of this, he left a lot of potential aesthetic beauties from reaching the inside of Palermo’s cathedral. In a serious envy of one another, it is said that both of these men died of heart attacks shortly following viewing their competition’s cathedral. Makes for a good story anyhow. William was amazed to see such a beautiful exterior that he thought the interior of the cathedral would be just as amazing and Gualtiero also thought vice versa, and as we now know, both men were misled. Monreale is located a few km from the center of Palermo. If you have read up about the unreliability of public transportation, you can discover that getting out to where you want to be is not as easy as it ought to be. Taxi. The drivers are not the friendliest nor the safest on the road, but this is an option. Expect to pay more than you should for this method of transportation. Organized Tours (Most Popular). Pick-up/drop-off is included with the cost, but the best part, is that you are accompanied by a professional guide. Renting a Car. It is preferable to use your own rented car over taxi, but it requires you a bit of practice to get used to the reckless Sicilian drivers. Just take a few minutes getting adjusted and you should be fine. If you decide to still choose public transportation (and may the Gods be in your favor), there are two buses that make this trip. Which Bus from Monreale to Palermo an Vice Versa? As I said, there are two buses which take you to Monreale. You will find both of them in Piazza Indipendenza (behind the Norman Palace). Getting back to Palermo means getting back on that same bus and returning to its departure point. AST Bus. This takes you directly to Monreale at Piazza C. Inghilleri behind Corso P. Novelli about 300 meters from the Cathedral. AMAT 389 bus. This (operating from 7:30 a.m. to 8:10 p.m. on working days) stops at Piazza Vittorio Emanuele (Duomo square). You can ask locals about when the last bus is leaving from Monreale as this is going to change based on the season and demands. 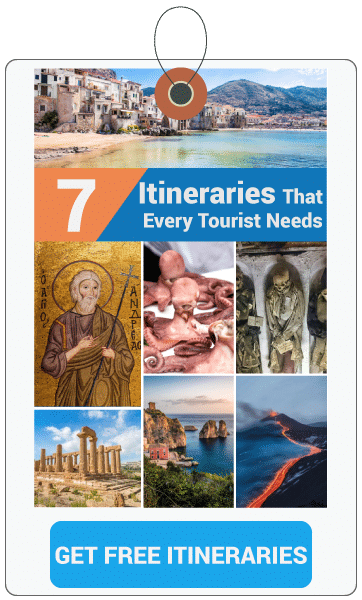 Let me tell you that if you have the money to get a rented car or get in on one of the organized tours headed to Monreale, this can save you a lot of headache and let you have a better time overall. While I am trying to give you the best and most accurate information, all of this changes so regularly that you almost have to double check every day to get the best information. Weekdays. From 8:30 a.m. to 12:30 p.m. (as last entry) and from 2:30 p.m. to 4:45 p.m. (as last entry). Public holidays. From 8:00 a.m. to 9:15 a.m. (last entry) and from 2:30 p.m. to 4:45 p.m. (last entry). During liturgical celebrations, visits and tours are not permissible. The cost of an admission ticket is 4€. Double check that you can enter and visit the Cathedral before you disembark for Monreale if you are touring alone. If you are part of an organized tour, they will handle all of this information and planning for you. Much like almost 90% of the other visitors, you have wisely determined that touring with a local guide is the best way to see the Cathedral and the town. Now the question is, which one is the best one for you? There are a lot of great options, but one of the best is the half-day tour with a local guide where you will discover the Cathedral along with another symbolic place in Palermo, the Catacombs. A van will pick you up at your hotel and your first destination will be the Catacombs of the Capuchins: a macabre place that houses thousands of mummified bodies, including many priests. From this first stop you head off to the Cathedral of Monreale. If you are not interested in Catacombs, you can see the Duomo in another tour which takes you to Cefalù. These should help you to get where you want to go. Do not forget to try the bread in Monreale when you are there, it is world-renowned. If you still have any questions or concerns, use the comment box below to ask me a question and I will get back to you as soon as possible. I’m full-blooded Sicilian born from the noise of the Vucciria market and the gentle sound of the waves of Mondello. I grew up eating “pane e panelle” and “pasta con le sarde”. But most of all, I grew up with an awareness: Palermo is a beautiful city to live intensely and to love without question!